ElegantZine Blogger Template is free blogger template adapted from WordPress Theme to Blogger Template with simple layout. Template features : white and gray, 2 columns, 1 right sidebar, featured posts, simple slider menu, dropdown menu with orange color, social bookmarking icons ready on sidebar, tab view menu include popular, tags and blog archives, ads ready and more. 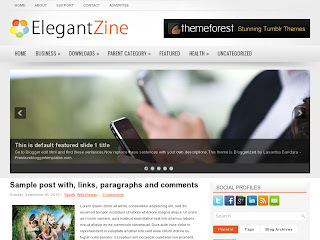 ElegantZine Blogger Template can be used for personal or general blogs.